This world is a beautiful place. It’s really amazing how different countries with their unique cultures exist in harmony here. I know, there are some exceptions; however, I think that is almost negligible when I see the culmination of values and beliefs in our universe. Everyone is exclusive and different, yet all of us make this planet livable. As a mature person who got the chance to understand the ethos of a few other continents, I can proudly say that our country holds a different space in this world, a culture that is known for its strong family system and core values. Feeling proud about our mother land is no unique. But being an Indian, I have gained so much at my professional front. Yes, I am a working mother of a 3-year-old boy. I have close to 9 years of experience in software industry and I am looking forward to work for more and more years. Being a mother and being a professional person bring two different kinds of challenges in life. And when you work for a demanding client of a distant country, the expectation automatically gets high. Last year I got aligned to a project which belongs to a US client and the client company is known for its rigid approach towards accepting changes. But work is work, no matter who is the client. As a usual process of a US client project, our client team keeps on visiting India to see things more closely. So last year, client company’s the toughest person visited us. Jeremiah is the engineering VP of the client company. He is known for his rude nature and arrogance. Before he landed in India, the whole offshore team (that includes me) was given instruction about how to talk, how to ask a question and how to reply his queries. My India managers didn’t want to give any chance to Jeremiah to question over team’s capability and work ethics. His visit was planned for a week and the whole week went under pressure. Jeremiah called back to back meetings and discussions. The team was in fear of his questions. Although he tried to be friendly with bringing cakes for the team, still his way of talking was so blunt that people from the offshore team couldn’t connect to him much. On Jeremiah’s last day of the visit, which was Friday and coincidentally Janmastmi, a team party was being organized. This was to say goodbye to him. I denied for the party because it was coinciding with my son’s daycare timings. Thankfully my office provides daycare for kids, so I take my son with me every day there and we stay close to each other. My son’s daycare span ends at 5 PM and the party was planned from 3 PM to 8 PM. My manager tried his best to convince me for the party but I gave him the reason of my son being in daycare. He then suggested taking my boy along in the party and that seemed to me a fair deal. I thought this way my boy would also get a chance to enjoy. He loves dancing and Indian music, especially Punjabi numbers. So, we both mother and son reached the party venue with my other teammates and the party finally started with some ice breaking activities and quiz. I was 50% in team activities and 50% around my son. I was making sure he was not bored, hungry or tired. I kept on giving him snacks so that he could stay with me during those team games which were of no use for him. I must say that he is a jolly baby. He remained calm during the party and even enjoyed whatever way he could. Jeremiah was noticing me and my son. Then suddenly he got injured and quickly I gave him a Band-Aid which I had handy in my son’s diaper bag. I also made sure he needed any other medical help. This small incident changed his behavior towards me. My motherly instinct left a good impression on his heart. I and Jeremiah are good friends from that day. He cares for my late night calls and family time. I really felt happy when he mentioned, during an activity, that he found me a ‘Tough’ person who is able to manage work and kid with giving equal importance. If you ask me, the reason of his changed heart, I would say it’s our Indian culture and family ethics. In our country, a child is everything for a mother. She can forget to remember God once, but she can never forget to wish well-being of her child. These values automatically are imbibed in me and that’s why I don’t find interest in any such thing that can affect my son. For example that party. I found it worth going there only when my son was with me. 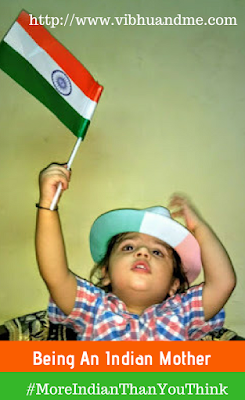 We Indian mother are programmed to love our kid to a deep emotional level. As per the book “Cultural Variations in Psychopathology”, Indian mothers preferred to confront the child whereas the majority of German and US mothers expected the child to express his or her needs first. The book also says that Indian mothers are more sensitive and proactive towards childcare. I also feel being an Indian mother, gives me the confidence to put everything aside (even the demanding boss) and focus on my son. It’s amazing that Indian values and belief made me a known face in my client team. They freely talk to me and ask about my family. We have a professional relationship but my Indian way of thinking, somehow, gives them confidence to talk to me in more casual way. This is a success for me, something which I got being an Indian mother. 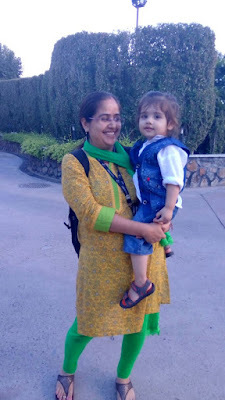 I can say that I am a working mother who is #MoreIndianThanYouThink. The time is not far when we will have to pay for bottled oxygen too. Thought provoking blogpost!